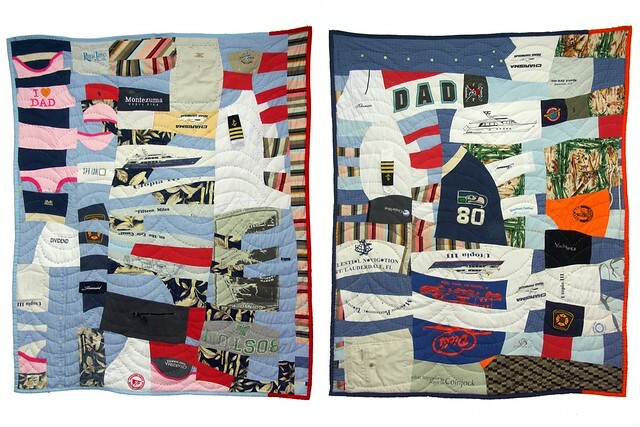 Amy Hill commissioned these two memorial quilts from her husband's clothes for her children Quinn and Sailor. Materials include David's T-shirts, dress shirts, captain's shirt, swim trunks, pants, ties, baseball caps, and clothing and bibs from the children. Amy cut apart most of the clothing and sent the segments to me in two separate boxes. One for Quinn and one for Sailor. David was a ship's captain, who died at sea saving the lives of his crew members. I improvised the quilt pattern to create a sense of flowing waves and light on water. The quilts are each 42" x 57", mostly machine pieced with some hand piecing, hand quilted and finished with a fold over binding. "Don't worry about a thing. Cause every little thing is going to be all right." is machine embroidered on the back of each quilt. These two quilts took a total of 43 hours to complete. 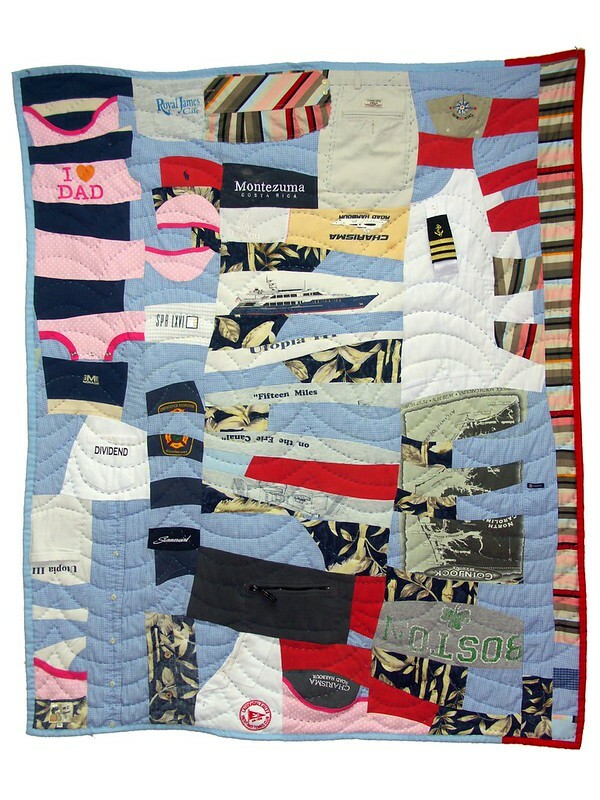 David Hill (1956-2010) for Quinn, 2012, 42" x 57", machine pieced, hand quilted, clothing. 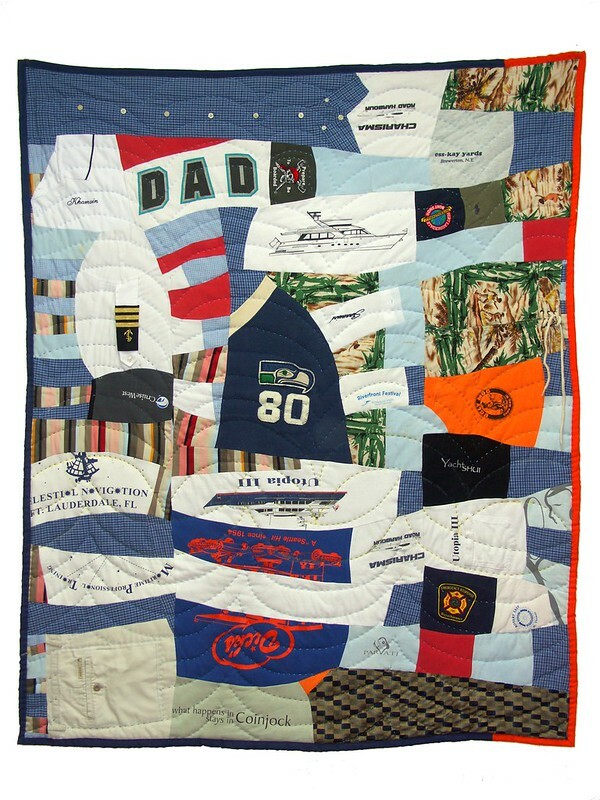 David Hill (1956-2010) for Sailor, 2012, 42" x 57", machine pieced, hand quilted, clothing. For information on having a memorial quilt made or about the bereavement quilt making process contact me or visit Passage Quilting.